Posted 15 September 2009 in Uncategorized. DC Comics’ program of publishing new collected editions of Jack Kirby’s work has been wonderful. It is a great time we live in, with so much of Kirby’s work available in the stores. Having these books at hand certainly helps the Kirby Museum in its mission “to promote and encourage the study, understanding, preservation and appreciation of the work of Jack Kirby”. A huge thank you to everyone associated with bringing this series about. Unfortunately, 2008’s Jack Kirby’s OMAC: One Man Army Corps contained a few production errors: many of the splash pages that originally contained indicia were stretched to fit the printed page. I’ve aligned the images at the top text. There’s one very nice improvement that DC brought to the OMAC book, which I will highlight in a future entry. Thanks to James ROMBERGER for the heads up. Posted 11 September 2009 in General. Jack KIRBY provided the pencil art for the cover of the Disneyland Convention held April 9th, 10th & 11th in 1971. The art features Kirby’s “Super-Escape Artist” Mr. Miracle and his assistant Oberon being held by Grumpy, from the Disney animated feature “Snow White and the Seven Dwarfs.” Thanks to Greg THEAKSTON for gifting a copy of the program to the Museum. At the convention, Kirby sold a portfolio of eight of his New Gods character designs. The images were printed in grayscale on 8 1/2″” by 11″ paper, and held in an unmarked envelope. Photos taken by Vincent DAVIS from the Disneyland Convention were featured in the July 1971 issue of Richard KYLE’s Graphic Story World newsletter. Thanks to Alex JAY for gifting a copy of the newsletter to the Museum. 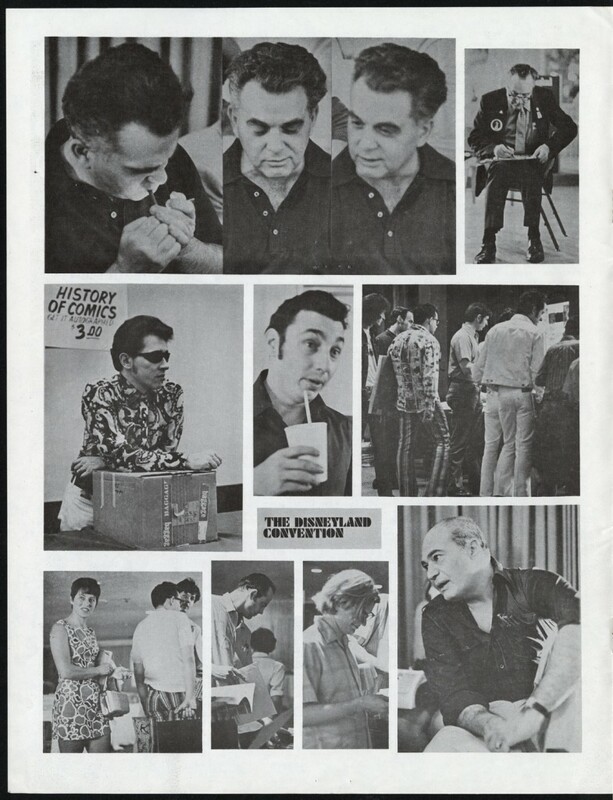 The page is captioned on the next page: “ON THE LEFT: Top row: Jack Kirby; Forrest J. Ackerman. Second row: Jim Steranko; Jerry O’Hara (convention organizer); Bill Stout, Mike Royer (in stripes), Bob Foster, Larry Kenyon (in white obscuring Jim Steranko, who is displaying his art). Bottom row: Janet Royer, Mike Royer, Mark Evanier; Milton Gray; Mark Kausler; Carmine Infantino. =photography by Vincent Davis.” If you have any photos, memories or further information regarding Kirby’s attendance at the 1971 Disneyland Convention, please contact me and I’ll try to include them in this piece. (Added 3 October 2009) I’ve added a scan of a photocopy of what appears to be Kirby’s original art (with paste up) for the booklet. Note the art around the edges that was cut due to the bleed of the printing. Also note that “Mister Miracle” was removed and “Jack Kirby” was added before printing.